Start your trip into the smallest streets of Antwerp. Use your imagination as a time machine to go back to the Middle Ages. This alley dates back to 1591! This area lies in the shadow of our cathedral. 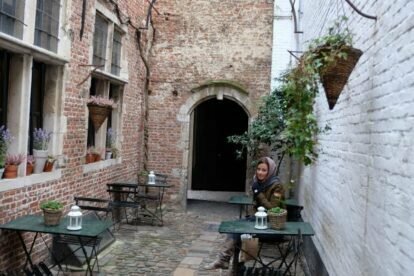 Although this is listed in the top 20 things to do in Antwerp, you won’t meet many tourists in the alley. I have seen that people don’t know of its existence or can’t find it. As a local I often go into the Vlaaikensgang as this is romantic and you can escape (especially on a crowded Saturday) from all tourists and shoppers. It doesn’t take a lot of time (reserve 10 minutes) to discover it. Inside the Vlaaikensgang there are 2 restaurants (‘t Hofke and Sir Anthony Van Dijck). The easiest entrance is via the street Oude Koornmarkt 16. Local tip: spend more than 10 minutes at the Vlaaikensgang during a concert of the carillon of the cathedral. Take a seat in the alley and relax.